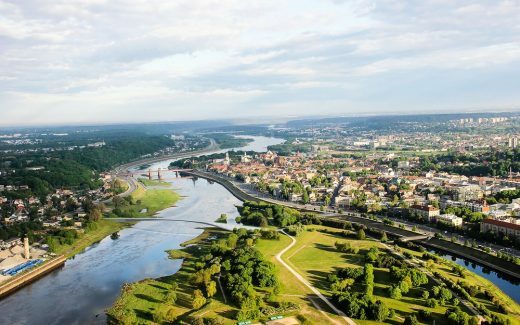 Lithuania’s second largest city, Kaunas, launched an international contest for a major new cycle route over the River Nemunas. 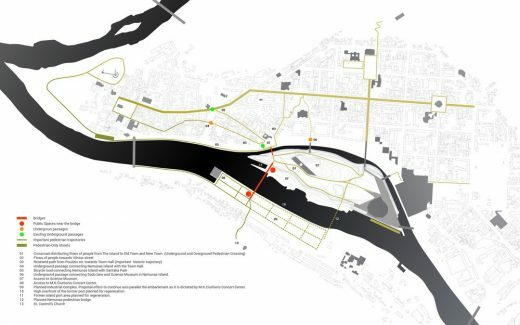 Organised by the Kaunas Architectural and Urban Renewal Council, the competition sought innovative proposals for a new pedestrian and cycle route connecting the city centre and Science Island with the industrial south bank of the river where a new concert hall is due to be constructed. 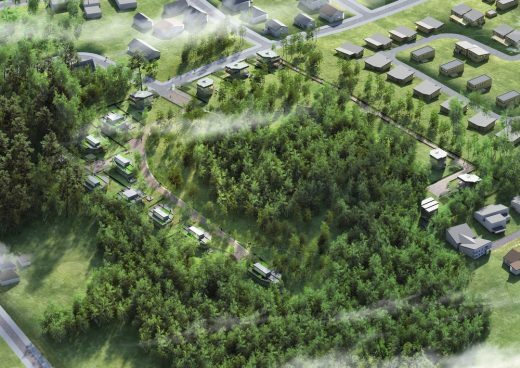 The project aims to create a new environmentally friendly link between two areas of the historic settlement which are currently only connected by heavily-congestion vehicle traffic routes. 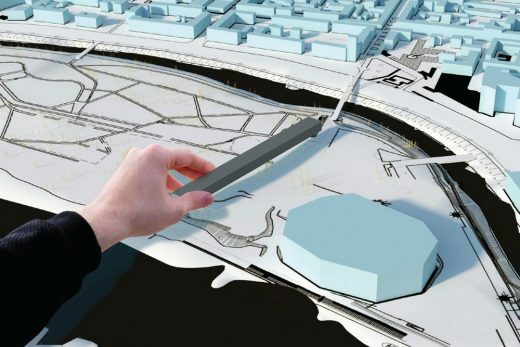 The new crossing will follow the South Bank – which is known locally as Aleksotas – crossing the river to reach Science Island and then crossing the river again to reach the city centre which starts at King Mindaugas Avenue. 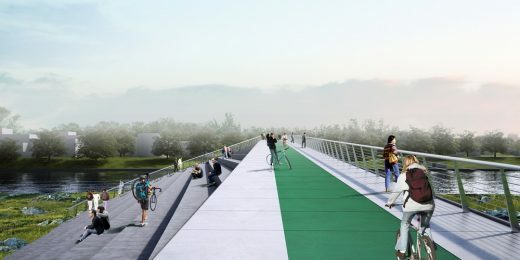 The visual expression of Nemunas Bridge is being followed by a simplistic idea – to minimize visual intervention with city skyline while forming panoramic public spaces near riverbanks on both sides. 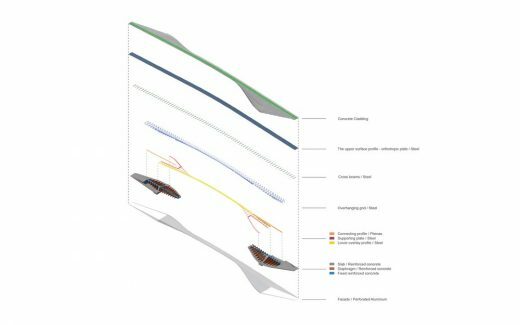 Steel truss arch structure defines specific character of Nemunas Bridge. 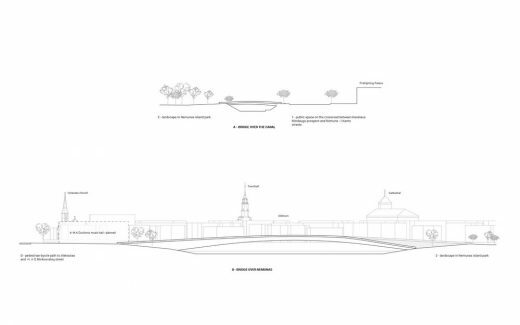 Its thin central appearance allows minimal intervention to the skyline of Kaunas Old Town. 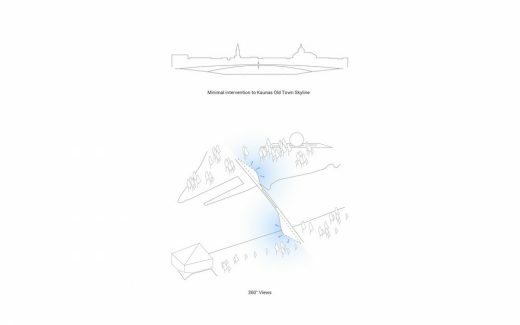 Supporting structure on the ends of the bridge retreats from Nemunas island port and access routes to Aleksotas new development and extends asymmetrically towards the main public interests to create a terraced public space while connecting the lower and upper quay terraces. 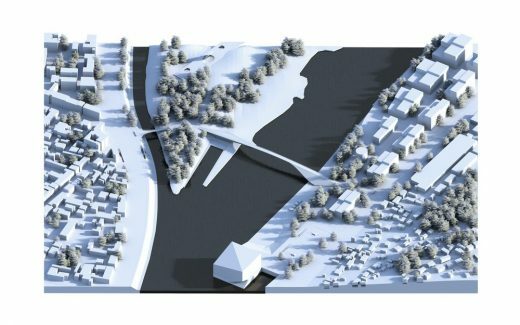 On Southern embankment of the river Nemunas Bridge is joining proposed plaza and it is accessible from H.O.Minkovskių street. 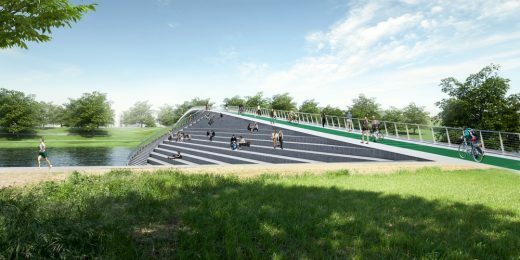 Amphitheatre facing M.K.Čiurlionis Music Complex with and panoramic view to Old Town is created on Southern end of the bridge. 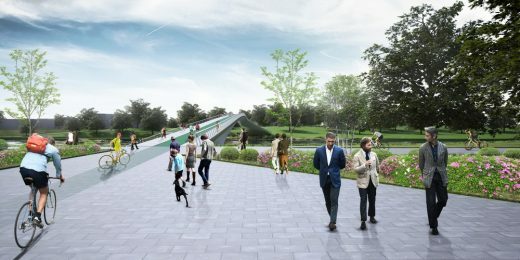 The Northern end of the bridge meets a path that’s emphasising the connection between two bridges and existing routes. 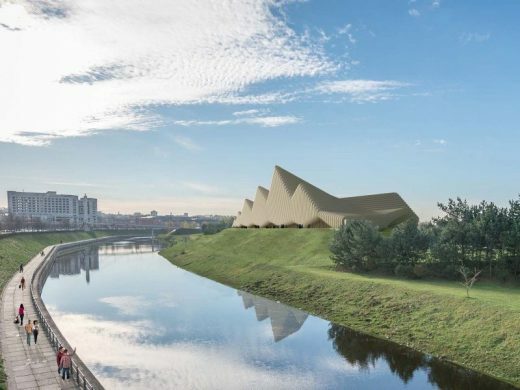 Sitting setting extends towards the Science Museum and the existing Zalgiris Arena creating a public space in the island with a view to industrial townscape on the river back and the newly developing Aleksotas territory. 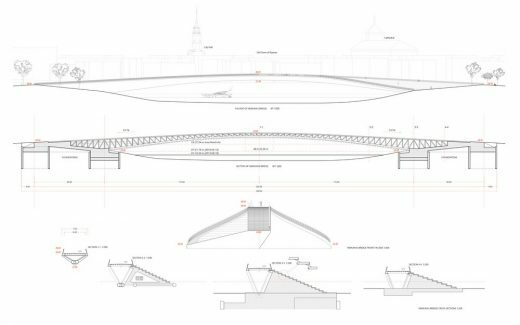 The transitional trajectory joints of the bridge becomes the place to stop, meet and see the city’s panorama 360°. Canal bridge is composed on the axis of the intersection of the Fire Station. 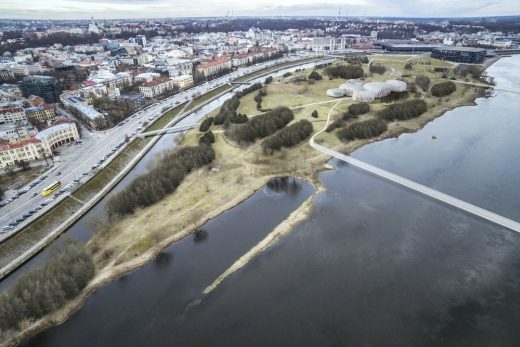 The minimal footprint on the natural coast of Nemunas island expands towards city centre and joins Karalius Mindaugas avenue creating wide, spacious entrance with bus stops and the underground passage. 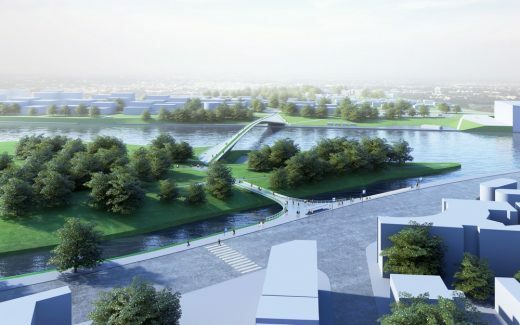 The new bridges will interlink the Oldtown, the Newtown and the Nemunas island on the north side of the river and connect these areas to the developing south side of Nemunas riverbanks – a long awaited connection that will positively change the dynamics of the pedestrian circulation in Kaunas city center. Nemunas Bridge: Length 320m, Span 220m, Area 3115sqm. 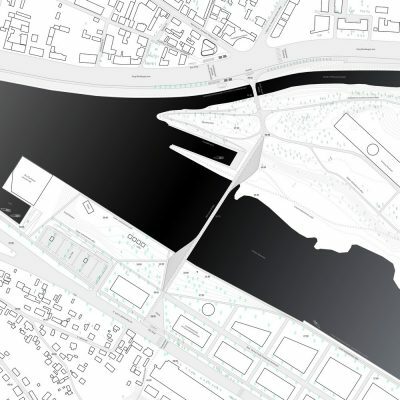 Canal Bridge: Length 57m, Span 45m, Area 645sqm.